The Cougars are going to dance in San Diego. 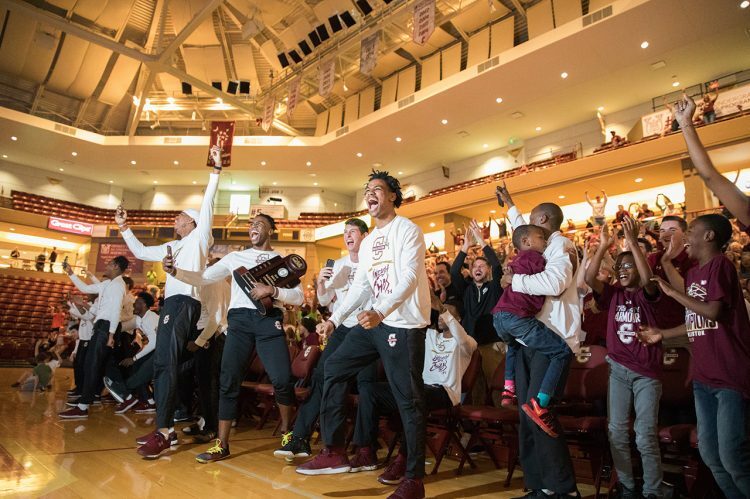 The NCAA Selection Committee has placed the College of Charleston Men’s Basketball team in the Midwest region of the NCAA basketball tournament. The No. 13-seeded Cougars (26-7) will play No. 4-seeded Auburn University (25-7) in the first round of the tournament on Friday, March 16, 2018, at 7:27 p.m. (EST) at the Viejas Arena at Aztec Bowl in San Diego, Calif. The game will air on truTV. 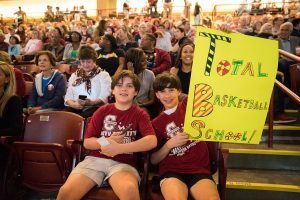 Close to 2,000 cheering Cougars fans assembled in TD Arena on Sunday evening to watch the live national broadcast of the NCAA Selection Show on TBS. 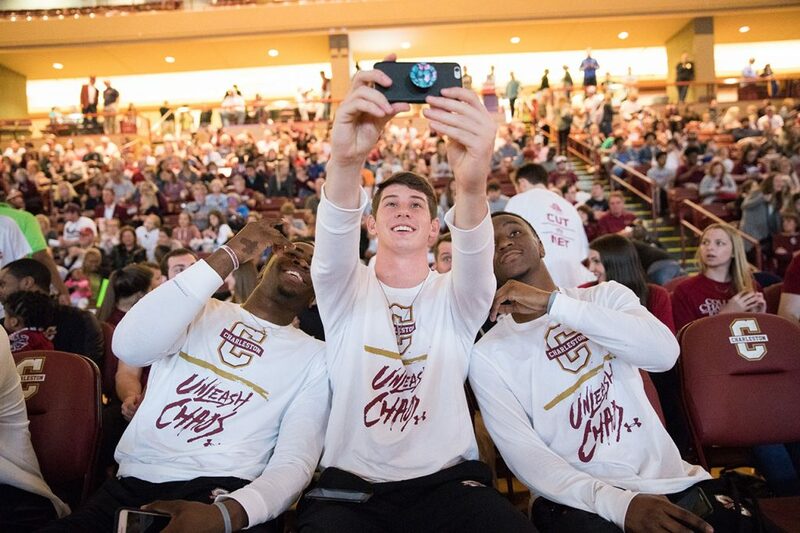 Members of the Men’s Basketball team signed autographs and chatted with fans ahead of the big announcement. The crowd sat in nervous anticipation while the brackets were unveiled and roared with delight when the College of Charleston’s name appeared on the screen announcing the Cougars will play the Auburn Tigers in the first round of the tournament. The Cougars received an automatic bid to the NCAA Tournament after capturing the Colonial Athletic Association’s championship title last week. 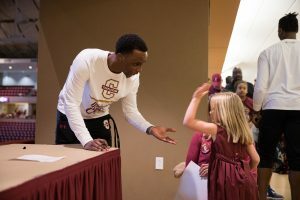 CofC Men’s Basketball Coach Earl Grant praised the fans for their support. Cougars fans gathered at TD Arena ahead of the NCAA Selection Show. 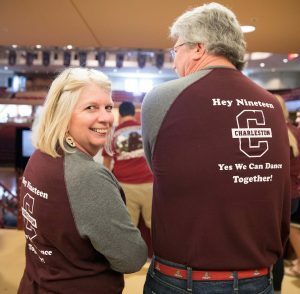 Mark and Patty Weber were among the many fans that packed TD Arena to watch the selection show on two large video screens. 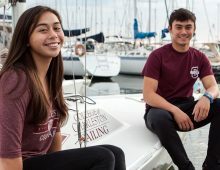 They both wore matching T-shirts that read “Hey 19,” a reference to a song by the music group Steely Dan. It has been 19 years since the Cougars played in the NCAA tournament. This is the team’s fifth all-time appearance in the NCAA Division Tournament. Mark Weber says he has high hopes for this team. Mark and Patty Weber were among the many fans that packed TD Arena to watch the selection show. “I think that their defense and quickness will give them an edge up,” he says. 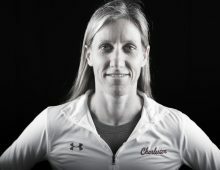 John Kresse, who was the head coach the last time the Cougars were in the NCAA Tournament, says that his advice to the players is to enjoy the moment, but to remember that the hard work starts now. If the Cougars win their first-round match, they would play the winner of the Clemson/New Mexico State game on Sunday, March 18, 2018. All photos by Mike Ledford.